Nature decided to upstage the rest of the presenters during a microgrid tour last week at the Gordon Bubolz Nature Preserve in Appleton, Wisconsin. 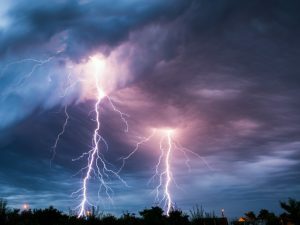 A massive thunderstorm hit on September 17 as about 75 members of the International Association of Electrical Inspectors (IAEI) toured the new 18,000 square-foot green building, served by the microgrid. “You couldn’t even open the door to the building, the winds were blowing so hard. Torrential rains,” said Don Wingate, vice president of sales, utility solutions for Schneider Electric which worked with Faith Technologies to build the microgrid. The electrical inspectors had come to learn about how the advanced microgrid offers electric reliability when the power goes out. And then — defying probability — the power did just that. As if on cue for the tour, thousands of homes and businesses in the community went dark. But not the nature center. 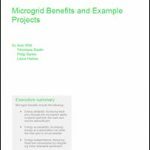 Its microgrid did what microgrids do — “islanded” in a “bumpless transition” from utility power to on-site generation, Wingate said. The lights in the building never went off; those on tour didn’t know there was a problem until they were told. 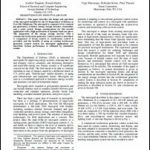 Advanced microgrids sense a distruption on the power grid and island or disconnect from it. On-site generators or batteries then kick on to keep power flowing in the building. “Everybody was amazed there wasn’t even a flicker at the building. The microgrid was operating up to speed, and all of these electrical contractors got to witness it,” he said. Meanwhile, 10,000 utility customers lost power from the storm, according to a Green Bay television station, which described the storm as torrential, causing flash flooding and sewer overflows and forcing evacuation of several buildings, including a fire station. The electrical contractors were in town for an IAEI conference; the microgrid tour was part of the conference. In many ways, Nature couldn’t have picked a better crowd to impress. The inspectors ensure safe installation and operation of electrical equipment, and many work with cities and towns, prime microgrid candidates. “For them to see this emerging new technology — microgrid technology — it gave them confidence this is not a fluke. This is real,” said Wingate, who was at the center for the microgrid tour. Wisconsin-based Faith Technologies engineered, procured and constructed the nature center’s microgrid, which uses five distributed energy resources (DERs), as well as a grid connection. Schneider Electric’s Energy Control Center manages the DERs. Its EcoStruxure Microgrid Advisor, a cloud-connected software-as-a-service platform, optimizes the configuration. The project was unveiled June 1, but Schneider and Faith Technologies offered a preview at Microgrid 2018 in Chicago May 7. Join us for Microgrid Knowledge’s next annual conference, “Microgrid 2019: Shaping the New Electric Grid,” May 14-16, 2019 in San Diego. Perfect example of how good a Micro GRID can be. That doesn’t even mention the power saving in dollars, the ability to be clean with Renewables, the appliances and other equipment that could be damages without it. Good job.